Christian brotherhood is not an ideal that we must realize; it is rather a reality created by God in Christ in which we may participate. The more clearly we learn to recognize that the ground and strength and promise of all our fellowship is in Jesus Christ alone, the more serenely shall we think of our fellowship and pray and hope for it. The Big Idea: We abandon our own opinion of what Christian community should be and live in the divine reality of what God created it to be. If we insist the community must match our ideal or fantasy, we will keep our fellowship becoming authentic, transparent, and Christ-centered. Christianity means community through Jesus Christ and in Jesus Christ. No Christian community is more or less than this. Whether it be a brief, single encounter or the daily fellowship of years, Christian community is only this.We belong to one another only through and in Jesus Christ. The Big Idea: The Life of the Father flows through Jesus into you and it flows from the Father through Jesus into every believer, This connects us in a real, authentic community that is based solely and wholly on our relationship to Jesus. Without our connection to the Vine, we can do nothing. When we are connected to the Vine, we can do all things. In community with Christ, the Holy Spirit enables us to live together in visible fellowship. The Spirit runs from the Vine to the branches, energizing us to live as God intended. The Spirit teaches us how to align with God’s agenda – and then prompts us to stay in alignment with Jesus and the Father. …it is essential to understand our community in Christ is a spiritual community not a social one. We are drawn together and connected by our beliefs in Jesus, not by the interests or hobbies we have in common. We are directly connected to the Life of Christ, placed within us when we submit our lives to him. His Life working in us enables us to live in visible fellowship with each other. Go Nebraska! I Will Be at the Game Tonight Against Michigan! To be like Jesus…We must be unconditionally committed to one another, to a local Body of Christ, in order to grow in Christ-like character. We must develop a grateful heart for God’s gift to us of one another. 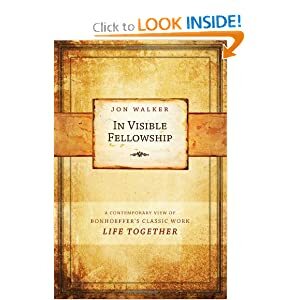 Jon Walker‘s book, In Visible Fellowship: A Contemporary View of Bonhoeffer’s Classic Work: Life Together builds on one of Dietrich Bonhoeffer‘s famous themes, namely fellowship. Chapter 2 is “We were created to share God’s grace together.” Walker builds on Bonhoeffer’s point that fellowship is often much deeper than we what we think it is. Yes, fellowship is much, much more than just getting together! By God’s wonderful grace, we gather together in Jesus! On the morning of that day, between five and six o’clock, the prisoners were taken from their cells and the verdicts of the court martial read to them. Through the half-open door in the room of the huts, I saw Pastor Bonhoeffer, before taking off his prison garb, kneel on the floor and pray fervently to his God. At the place of execution he again said a short prayer, then climbed 120 steps to the gallows, brave and composed.” With those calm but graphic words, the medical doctor serving the Flossenburg concentration camp describes the finale of Dietrich Bonhoeffer’s eventful life. Vivian Green quotes the doctor as he tells the Bonhoeffer story; then claims that during the 20th century “the Churches were to be confronted with a more brutal persecution than they had ever before experienced, even under the pagan Roman emperors, as the ruthless leaders of Bolshevik Russia tried to stamp the Orthodox Church out of its very existence and Nazi dictatorship sought to make the Church subservient to its own semi-pagan philosophy” (A New History of Christianity). We, who live in comparatively stable nations, are apt to overlook the fact that today, religious persecution continues in many parts of the world. Bonhoeffer’s experience speaks on the current issues powerfully but the specifics of his era are fading from living memory. We do well to examine current dilemmas in the light of both Scripture and history. Dietrich Bonhoeffer and his twin sister were born on February 4, 1906, while it was still easy to believe that Tennyson was right. When the great poet dipped into the future, he envisioned war drums no longer throbbing and battle flags being furled within “the Parliament of man, the Federation of the world.” Then, in 1914, World War I burst upon humanity. Many national Christian leaders on both sides blessed the war they hoped would end all wars. In hindsight, can we better see how war negates Christian values? Even the terms of the peace achieved in 1918 perpetuated human suffering and created conditions that led to World War II. Bonhoeffer studied both the Bible and theology so diligently that at just 25 years of age, he was appointed a lecturer in the University of Berlin. Two years later, Adolf Hitler seized leadership of Germany. In response to Nazi policies, Bonhoeffer helped to establish an “underground” seminary to foster Christian values. However, his role in the “Confessing Church” seminary earned him exclusion from the University of Berlin. The Gestapo also closed the seminary and put 27 former students in prison. Bonhoeffer’s books reflect upon such harsh experiences. Some of his best are entitled The Cost of Discipleship, Letters and Papers from Prison and Testament to Freedom. They demonstrate clearly why the theologian and the chancellor were on a collision course. Bonhoeffer nurtured a startling conviction: “Only those who obey can believe, and only those who believe can obey.” His definition of grace was likewise provocative: “Cheap grace is the deadly enemy of our church. We are fighting today for costly grace. Cheap grace is to undervalue the greatness of the gift of salvation. The sacraments, the forgiveness of sin and the consolations of religion are thrown away at cut prices… . Cheap grace is the preaching of forgiveness without requiring repentance, baptism without church discipline, Communion without confession, absolution without personal confession. Cheap grace is grace without discipleship, grace without the cross, grace without Jesus Christ, living and incarnate” (quoted in Dietrich Bonhoeffer: Witness to Jesus Christ). Between 1930 and 1939, Bonhoeffer travelled to England and North America to engage in study, pastoral ministry and finally, in lecturing. He could have easily remained a safe distance from the dilemmas of his home country. During 1939, in New York, he concluded that crossing the Atlantic again was “a mistake.” As he thought and prayed about his personal situation and that of Germany, he believed God’s will for his life was clarified. “I will have no right to participate in the reconstruction of the Christian life in Germany after the war if I do not share in the trials of this time with my people,” he wrote. “Christians in Germany face the terrible alternative of either willing the defeat of their nation in order that civilisation may survive, or willing the victory of their nation and thereby destroying our civilisation. Soon after Hitler became chancellor, his government scheduled a boycott of Jewish businesses and placed picket lines in front of factories, stores and shops owned by Jews. Julie Bonhoeffer, Dietrich’s 91-year-old grandmother, refused to obey the discriminatory laws. She brushed past the guards outside a Jewish store, entered and bought strawberries. The guards dared not touch the elegant, alert, elderly woman. The Bonhoeffer family was like that—courageous and principled. More than a decade later, the commitment of Dietrich’s extended family and associates would help to precipitate his untimely death. When Bonhoeffer returned to his homeland on July 27,1939, he gave support to the political resistance against Hitler. By 1941, he was forbidden to print or publish his convictions. Even so, he identified with “Operation 7” and its aim to rescue Jews. Two years later, he announced his engagement to Maria von Wedemeyer. That relationship added joy but intensified his peril; Dietrich, his sister, Christine, and other relatives were arrested during April, 1943. In Tegel Prison and even Buchenwald concentration camp, Bonhoeffer seemed calm, cheerful and firm, “like a squire from his country house.” He talked to his warders “freely and friendly and clearly as though it were mine to command.” People said he bore “days of misfortune equably, smilingly, proudly, like one accustomed to win.” But, penetratingly, the prisoner asked himself: “Am I then really all that which other men tell of? Or am I only what I myself know of myself? Restless and longing and sick, like a bird in a cage, struggling for breath, as though hands were compressing my throat, yearning for colours, for flowers, for the voices of birds, thirsting for words of kindness, for neighbourliness, tossing in expectation of great events, powerlessly trembling for friends at an infinite distance, weary and empty at praying, at thinking, at making, faint, and ready to say farewell to it all?” Who am I? The lonely question mocked him insistently until he cried out, Whoever I am, Thou knowest, O God, I am thine! How should a Christian live and witness within a nation that is controlled by evil men, with almost unchecked power to destroy others? Bonhoeffer cherished high ideals. On a visit to America in 1930, he had taken and failed three driving tests. A friend suggested that if he slipped the examiner $5 he would pass but Bonhoeffer preferred to forego having a licence altogether rather than bribe an official. The dilemma of what to do about Hitler was enormously difficult, especially for a convicted pacifist. Bonhoeffer reasoned: “If I sit next to a madman as he drives a car into a group of innocent bystanders, I can’t, as a Christian, simply wait for the catastrophe, then comfort the wounded and bury the dead. I must try to wrestle the steering wheel out of the hands of the driver.” When the diary of Admiral W W Canaris was discovered, Hitler’s suspicions of yet another plot against him were confirmed. Massive, immediate retribution was ordered. Eberhard Bethge, Bonhoeffer’s finest biographer, claims that on or about April 9, when Dietrich was hanged, 5000 others were slain as well, including three other members of the Bonhoeffer family (The Encyclopedia of Religion). Looking back, we see the year 1945 as a hinge of history. Before that tragic April ended, Hitler had gone through a bizarre marriage ceremony and he and his wife had taken their own lives. A mere seven days after that, Germany surrendered.